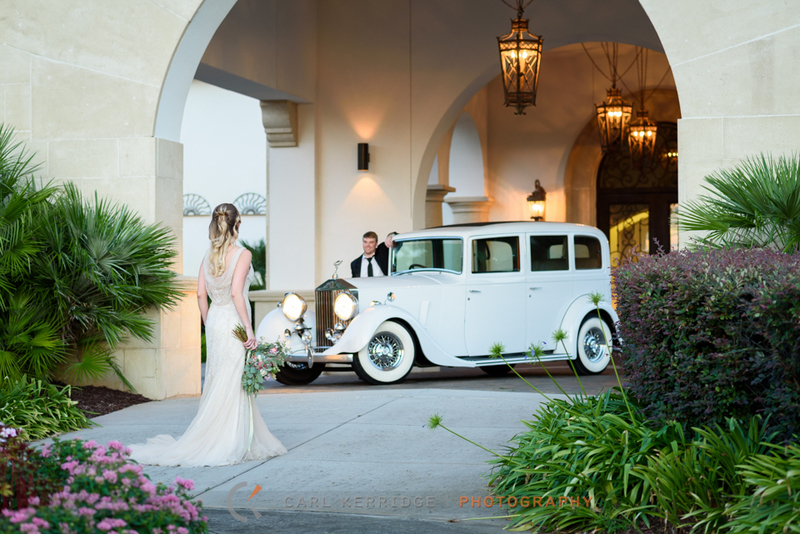 Oh The Great Gatsby, a tale of impossible love, dreams and tragedies….thank goodness the iconic style of the 20’s and 30’s is what mostly influenced our styled photo shoot! We did have a hiccup, but overall the day was just as successful and beautiful as part one of our styled shoot at the Dunes Club last week (incase you missed it here is that blog). Our model was superb. Mary and Wing transformed her in to a classical and elegant beauty. The dress! I will never forget that stunning design, how it fit our model like a glove and fitted perfectly to our Vintage Gatsby inspired theme. When she walked out of the changing suite, even bystanders awed as we exited the building. We marveled at her hair, makeup, and how well the dress complimented her and the look we wanted for this shoot. Then came the tiny tragedy, “Rollsmarie” (a 1930’s Rolls Royce) had a flat and the sun had already started to set. Were we going to have enough time to capture the essence of our location? 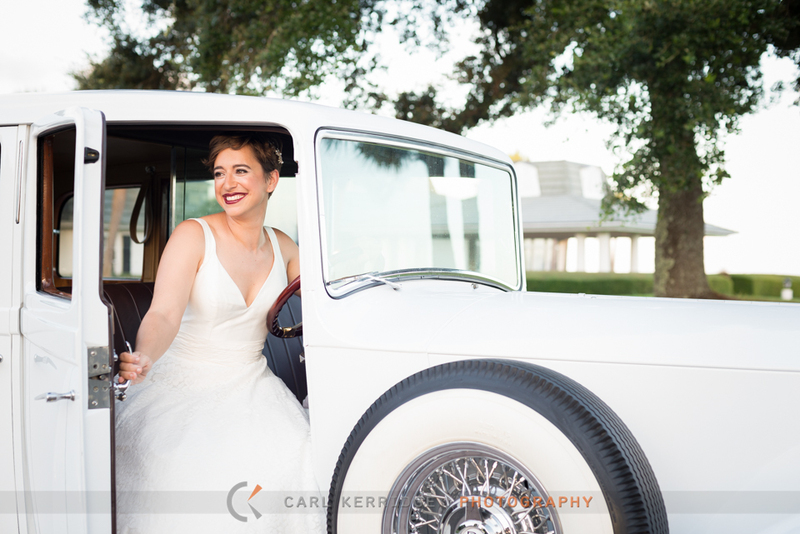 Making ample use of our time, we began without the classic car and Whitney moved beautifully in her vintage gown. Then, just as dusk hit, Robert cruised up and parked in front of the Members Club’s front doors. With the car on site, our models boyfriend lending his support as our groom to be, we all decided to continue shooting as the light dipped in to dusk. The cool breeze in the air with night approaching gave the shots more vibrancy and atmosphere that we anticipated! Remember from our other blog, I said I intended to make this styled photo shoot entrancing? Well, see for yourself! Thanks to the Members Club for allowing us to shoot at your beautiful location and to all the vendors involved for the time and effort to create such a wonderful series of images. In the past I have shied away from any kind of styled photo shoot. I prefer the authentic feeling of a real wedding day and the emotions that come along with it. However, there are times when you just can’t say no! 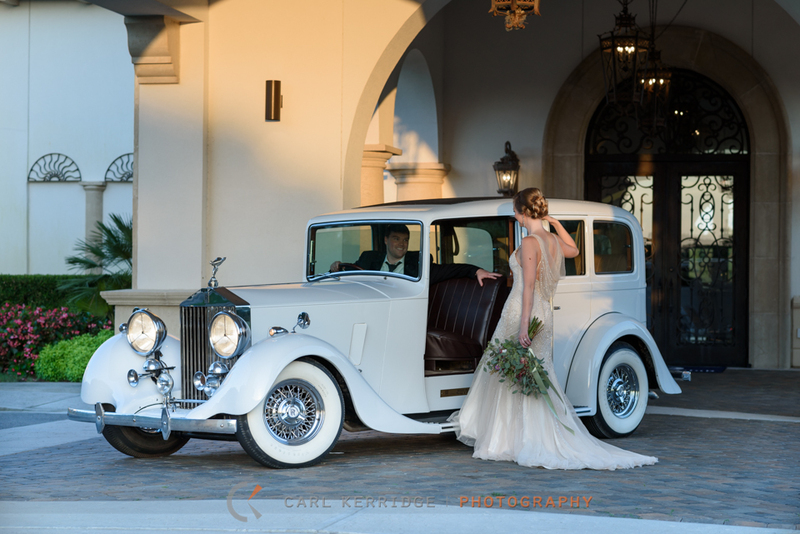 When the opportunity for a custom fitted 1930’s White Rolls Royce styled photo shoot came through, I did jump and say a big,” hell yes!” Icing on the cake was the car’s owner is a good friend and fellow Myrtle Beach wedding vendor, Robert Gerba with RSG Events Designs. He offered the car and I put on my planning hat! Then came the dream team of Myrtle Beach wedding vendors along with my model for the day and my lovely wife Jessica. For the actual shoot we had no rules, guidelines or preconceived notions of the final image. Ultimately we wanted to showcase the car as it is a new addition to our local wedding offerings but also create the images for a variety of marketing pieces that all the wedding vendors would appreciate. With all the flowers in bloom and crisp skies, August is just a gorgeous month to shoot in. Now, raise your hand if you’ve had a South Carolina wedding in August… yep it was that hot and yep, we did swindle a golf cart to carry our model around and keep her cool. Everyone involved helped make the shoot a huge success. From Mary dabbing and touching up lipstick, to Nicole helping fan out the dress to perfection, we even had Robert working the model’s veil like a pro. Robert would hide behind the Rolls Royce and spruce up the veil before I clicked my shutter. This brought the attitude into the images, the rest of the crew would cheer away, and our model’s smile made the moment. If you could have heard the sound of “Rolls Marie,” I’d say she even revved her engine nicely for us too! As we got ready to call it a day at The Dunes Club, I knew that we had to do another shoot. The next styled photo shoot needed to have a grandeur Gatsby theme, perhaps the infamous novel could help spark our imagination…. It’s not often you find two souls designed completely for each other, but when a passion for Taylor Swift unifies a couple, you know they play for keeps. I am so thankful this couple chose Myrtle Beach as their wedding destination. Christina is a Northern-Southern belle. I still can’t get over how beautiful her bridal pictures were on the bridge taken at the Dunes Club in Myrtle Beach! Her groom, Nathan, is a man of many talents. From playing in the band, swinging golf clubs to keeping a smile on Christina’s face, he just rocks it. One of my favorite moments of the day was their first look. As Christina came around the corner, the two joined hands and made a pinkie promises to each other before turning to see the other. When Nathan saw his bride, all words left him because of her beauty. Christina rested on the arm of his chair and presented his groom’s gifts, Nathan kept saying that they were the best presents ever. That softness and gratitude engulfed the two of them and was shared through the entire day. You could tell the couple planned each symbolic and meaningful moment for themselves and their guests. We couldn’t have asked for better weather either. I loved their portraits on the golf greens and the sunset. One in particular mimicked the bride’s mother’s wedding picture. Her father was holding her mother in his arms. For generations to come, I hope they share enjoyment at seeing the images side by side. Myrtle Beach has been the couple’s favorite vacation spot and its vendors helped their ceremony and reception become a masterpiece. The bride and their families baked approximately 3,000 cookies (a Pittsburg tradition) as the couple’s wedding favors and I think that everyone who came from out of town would agree they had more than enough sugar to take with them for the drive back to Pennsylvania. As for every couple meant to be, there was Disney’s Mickey and Minnie….oh, and of course a Rolls Royce! We hope you had a blast in Hawaii!